Peace of mind is only an app away thanks to this new baby monitor from Uniden that lets you keep an eye on baby, even when they’re home and you’re not. The Baby Watch BW3451R baby monitor is jam packed full of advanced technological features, but is still ridiculously easy to use and set up, making it the most practical and informative baby monitor yet. And here’s the best bit. In a feature that’s unique to Uniden, the Baby Watch BW3451R baby monitor can be controlled remotely by the Baby Watch app that’s free to download to your Android or iOS smartphone or tablet device. Parents can zoom, pan and tilt the camera to focus in on their baby while they are at work or out to dinner and the babysitter will be none-the-wiser. Parents can even say goodnight using the app via their smartphone. The Baby Watch monitor, with its huge 11 centimetre screen, works equally well when the whole family is home. An innovative camera can zoom, pan and tilt to get the best viewing angle and there is also a built-in night light and microphone to hear when your little one needs attention. The walkie-talkie function lets you speak to baby from another room or speak to someone in another room while you are tending to your baby. Temperature display, infrared night vision and a selection of lullabies are all standard features that add to the wow factor of this awesome little gadget. As amazing as this all sounds, there is still more. The Baby Watch BW3451R baby monitor is completely secure so it can’t be hacked and is digital, wireless and portable so you can even use it to keep an eye on the kids playing in the backyard while you’re cooking dinner. With the option of connecting up to four additional cameras, you can monitor not just the baby but all of your little cherubs and even view them in one glance with the option of four camera feeds on the one screen. 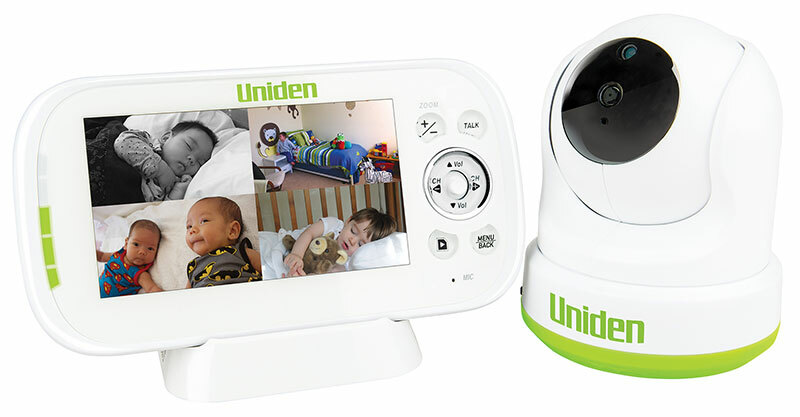 The Uniden Baby Watch BW3451R baby monitor is now available from these leading stockists and retails for $350.